The Robinson family acquired the Rokeby estate in the early 17th century. Thomas, the creator of the present house, succeeded his father in 1720, at the young age of 18. Deeply interested in architecture, 18thC engravings of Rokeby bear the words ‘Thos. Robinson, Architectus’. He was captivated by the designs of the 16th C Venetian architect Andrea Palladio, whose ideas were becoming fashionable in England through their publication and promotion by Richard Boyle, 3rd Earl Burlington (1694 – 1753). Robinson knew Burlington well and was encouraged by him to build in the new style. Robinson was also influenced by contemporary antiquarian interest in the buildings of Roman Britain and in the attempt by Robert Castell (d. 1728), a protege of Burlington, to reconstruct a Roman Villa. It is in this context that the Architectural Historian, the late Giles Worsley, described Rokeby as ‘a particularly erudite conception’. 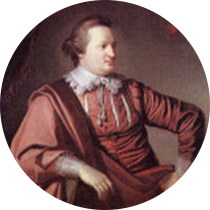 Thomas, known as ‘Long Tom’ Robinson to distinguish him from an identically named contemporary, is also known as the architect of the west wing of Castle Howard. In the 1740s he was Governor of Barbados and later part owner and manager of the Ranelagh Pleasure Gardens in London. There is a memorial to him in Westminster Abbey, Rokeby Church and the parish church of Merton. J.S. Morritt acquired the house from Robinson in 1769. He made various improvements including the construction of a new stable block, by John Carr of York, the creation of a print room, the completion of the church and the construction of the Abbey Bridge. In the late 19th C, his grandson R.A. Morritt interposed an intermediate storey into the east pavilion to accommodate his large family. 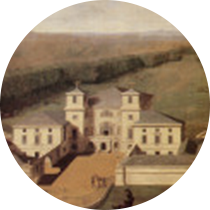 The extensions were carefully designed to be in keeping with the Georgian elevations. J.B.S. 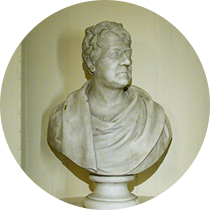 Morritt (1771 – 1843), the son of J.S.Morritt, owned the house for over 50 years. 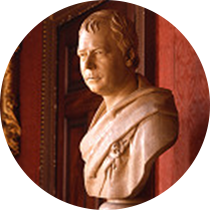 He was a close friend of Sir Walter Scott. A cultivated scholar and lover of the arts, it was he who acquired Velaquez’s ‘Toilet of Venus’ in 1809. Subsequently famous as the ‘Rokeby Venus’, it was sold to the National Gallery in 1906. A copy by WA Menzies, in the original frame, now hangs in the Saloon. In 1794 – 96 he made a Grand Tour which daringly included Greece and Anatolia.